To create professional-looking object, you can change the look by applying Styles. 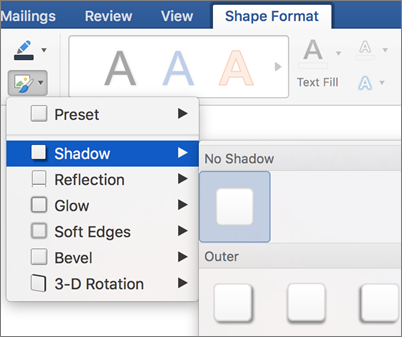 Styles change how the colors, fonts, and effects are applied and define which ones are dominant, or they apply effects, such as shadows, glows, reflections, soft edges, bevels, and three-dimensional (3-D) rotations. Click the object you want to change, and then click the Format tab. Note: The name of the Format tab changes depending on the object you click. For example, the object selected here is a shape, so the tab is called the Shape Format tab, and the names of all of the other commands change, too. Click the style you want. To see more styles, click . Click the arrow next to Fill or Outline, and then click No Fill or No Outline. Click the arrow next to Effects, point to an effect, and then click the effect you want such as Shadow or Soft Edges. Click the arrow next to Effects, point to an effect, and then click No [effect name]. Click the object that you want to change, and then click the Format tab. Under Shape Styles, point to a style, and then click . In the left navigation pane, click Fill, and then on the Color pop-up menu, click No Fill. In the left navigation pane, click Line, and then on the Color pop-up menu, click No Line. Under Shape Styles, click Effects, point to an effect, and then click the one that you want. Under Shape Styles, click Effects, point to an effect, and then click No [effect name]. Click the object that you want to change. On the Home tab, under Format, click Quick Styles, and then click the one that you want. On the Home tab, under Format, click Quick Styles, point to an effect, and then click the one that you want. On the Home tab, under Format, click Quick Styles, point to an effect, and then click No [effect name].